PraEis, Ltd. possesses an extremely well experienced executive management team.Thomas E. Kerr, President PraEis Ltd. developed the strategic plans project schedule and managed the creation of the Design Build Team that successfully completed these projects on time for the client. In. addition to his personal connections with the clients, he is well networked among the subcontractors, OEM's, and engineering firms who specialize in the power generating industry. Mr. Kerr is extremely well versed in the Design Build Delivery System and with 30 years of industrial construction management can operate an extremely cost efficient construction site. Thomas E. Kerr is responsible for the vision and senior management of PraEis Ltd. Prior to leading the operations of PraEis Ltd. Thomas served as the President and CEO of IC Construction Co., Inc., a $50 milllion Cleveland based General Contractor specializing in the industrial construction market with its headquarters located in Brecksville, Ohio. Before becoming the President of IC Construction Company, Inc., in 1991 and CEO in 1993 he served twenty three years in many capacities, from summer shop help to General Superintendent where he managed all of the field operations of the business from 1978 until 1995 working on projects ranging in size and scope from $5,000.00 to $20 million in the automotive, steel, chemical, and institutional sectors of the industry. While in this postion, Tom also managed the company's property, labor forces, and equipment. As President and CEO Tom directed the strategic transformation of the company from a $12 million dollar General Contractor serving old main line industries in Northeast Ohio to a nationwide $50 million Design Build expert in the power generation industry specializing in peaking plants. He led the corporate efforts in this transformation by developing and managing the corporate sales and marketing division, which turned the focus of the company to becoming partners with their clients as their solution providers for capital investment processes, while maintaining the highest standards in safety, scheduling, and constructibility. To this end, the company became "the risk management solutions partner" with their clients, vendors and suppliers for the project management of simple cycle gas trubines and co-generation facilities. Mr. Kerr also led the company in achieving ISO 9002 certification in the spring of 1999. They were one of only four general contractors in North America and Mexico to have received and maintained their ISO certification to date. Tom's ability to team build solid realtionships with National City Bank and IC's Bonding Company allowed him the opportunity to supply clients with the assurance they needed to know they are dealing with a high quality organization with longevity and capital coverage. During his thirty-year plus career in the construction industry, Tom has developed the unique ability to team with vendor and suppliers in relationships, which are developed on a win-win basis. In addition to his corporate experience, Tom's entreprenuruial spirit prompted him to assist other individuals in spinning off their organizations to focus on specialty contracting capabilities. One such organizaion is East West Construction Company, a minority general contractor that has been in business since 1988 and focuses on public projects such as hospitals, airports, schools and work at NASA. Thomas has held a varitey of professional affiliations including serving on the Board of Directors for the NEA (National Erectors Association) in Washington DC which provides its members with the highest level of labor relations and safety services as well as the promotion of positive labor management programs in the construction industry; the Board of Directors for the CIty Mission in Cleveland and as a Corporate Partner with the Cleveland Engineering Society, Assocation of General Contractors, and the Construction Employees Association. He currently serves on the Foundation Board of Directors for the North American Baptist Conference. Mr. Kerr earned a Bachelor of Science Degree in Construction Management at Purdue University in 1973. He has been working in the indsutry since he was 16 years old. As a life long learner, Mr. Kerr has taken seminars on topics ranging from Business Management to Employee Relations at Case Western Reserve University, Strategic Planning and Selling from the Kappa Group of New Jerseey, and the Executive Management Program of theAssocation of General Contractors. He is currently enrolled into he International Masters in Management Program at Purdue University and has one year completed. Mr. Kerr is dedicated to serving the Lord in all that he does and is a member of Parma Heights Baptist Church and has served in several ministries there such as the Finance Committee, Stewardship Program Management, and the Music Ministry. Dr. Shawana P. Johnson, Executive V.P. of Business Relations, has been involved in the strategic planning, financing and marketing and sales programs of companies such as General Electric, Lockheed-Martin, Hughes Aircraft, NCR, and Eastman Kodak over the past 23 years. She has personally developed partnerships with engineering firms such as Bechtel, Fluor Daniel, and Dames & Moore. During the last six years Dr. Johnson has been the president of Global Marketing Insights, Inc., which provides strategic planning, and sales and marketing services to the aerospace, power, and construction industries. Dr. Johnson's company developed and implemented marketing programs designed specifically to reach the direct clients, OEM's, industrial users in the power generation industry. Dr. Shawana Johnson possesses twenty-three years of sales and marketing experience in the Construction and Hi-Tech Information industries with companies such as NCR, McDonnell Douglas, and General Electric. At PraEis, Ltd. Dr. Johnson is responsible for the financial oversight of the organization as well as the development of business relationships including partnerships with OEMS, subcontractors, and business affiliates. Her responsibilities over the years have included global sales and marketing communications strategic planning, financial management and developing and managing a global sales force and distribution network in over 100 countries. She has also managed marketing research and development departments where she implemented programs and managed the Customer Service Centers which serviced 6,000 clients. She has managed and supervised the planning and development of the On-Line Network system for external sales and marketing use by clients and prospects, as well as, developed the plan for the in-house, on-line system access for customer and product information. Dr. Johnson is experienced in the development of 5-year strategic plans, the yearly development and delivery of these corporate strategic sales and marketing plans with complete budget forecasts to the Board of Directors. Dr. Johnson received her Doctorate Degree in Management from Case Western Reserve University, The Weatherhead School of Management, Cleveland, Ohio where her specialty was Global Economics and Technology Transfer. She is also on the Advisory Board of Directors for the Great Lakes Industrial Technology Council (GLITeC), which is funded by Battelle Corp. and is responsible for transferring and translating NASA technology into industrial and commercial services and products. She is also a member of the Technology Advisory Board of a Christian college, Cedarville University. 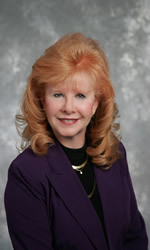 In her last position she served as the President of Global Marketing Insights Inc., where she served an international client base in the United States, Canada, South America, Asia, and Europe where her area of expertise included providing consulting in strategic (consultative) sales and marketing, developing three year Strategic Sales and Marketing Plans, including the compilation of marketing research studies to enable these geospatial technology companies to implement more accurate plans.